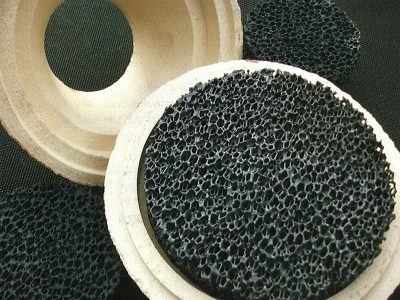 CERACAT+ foam filters are produced from high temperature Ceramic plus an addition of Carbon which further improves Temperature and chemical resistance to the liquid metal. They are recommended as a highly cost effective replacement for Zirconia and Carbon bonded filters in many Steel & Iron applications. CERACAT+ filters when correctly designed into a gating system help to remove inclusions from the metal stream and reduce turbulence preventing the risk of erosion and re-oxidation, thus reducing surface and subsurface defects on castings reducing finishing costs and in many applications increasing casting yield and mechanical properties of metal.